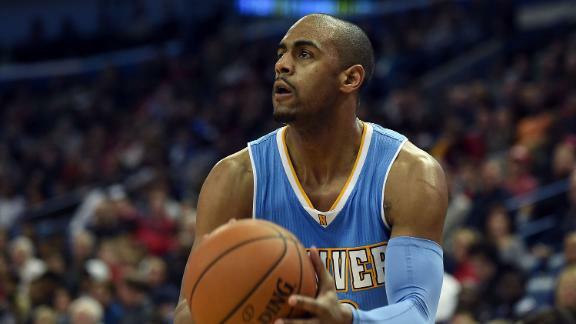 The Portland Trail Blazers acquired Arron Afflalo from the Denver Nuggets on Thursday in a package involving five players and a first-round draft pick, the team announced Thursday. The Blazers will send Thomas Robinson, Will Barton, Victor Claver and a lottery-protected first-round pick to the Nuggets for Afflalo and Alonzo Gee. The first-round pick sent to the Nuggets is lottery-protected in 2016 and 2017. It becomes two future second-round picks if the Blazers miss the playoffs in each of those seasons. "Arron is a proven winner with playoff experience who will be easily integrated into our culture," Trail Blazers president of basketball operations Neil Olshey said in a statement. "He possesses a skill set that complements our style of play on both ends of the floor and will make an immediate impact as we continue our playoff push. "Alonzo is an elite athlete and defender who adds a unique element to our perimeter." The Blazers, who have been on the hunt for bench help, get a veteran shooter in Afflalo, who has been a bit of a disappointment since the Nuggets traded for him last summer. He is averaging 14.5 points, but is having his worst shooting season in seven years. He has the option to become a free agent this summer. The Nuggets' goal in the deal was to acquire another first-round pick after they picked up two in a deal forTimofey Mozgov. Barton, Claver and Robinson are all part-time players who are all scheduled to be restricted free agents after the season. Robinson will seek a buy out from Denver, according to a source. Ramona Shelburne of ESPN.com contributed to this report. Amin Elhassan and Brad Daugherty break down the Trail Blazers' acquisition of Arron Afflalo from the Nuggets in a package involving five players and a first-round draft pick.